Is Your Mobile Web Traffic Sneaking Up On You? Unless you are looking at trend data on your website analytics, you may be missing an critical insight about the number of mobile visitors to your site. I recently started working at a new company, and I was quite surprised when I looked at the monthly numbers of mobile visits going back nearly 2 years. 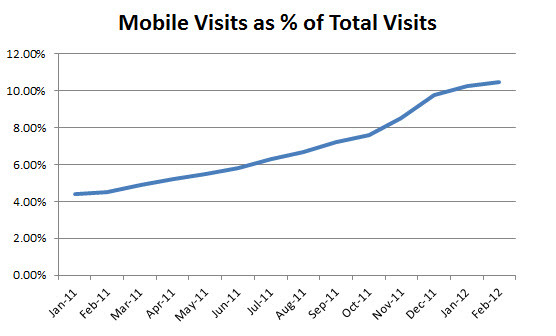 In May 2010 (the farthest I could go back), our mobile traffic was just 2.2% of total traffic. In February 2011, the percentage had more than doubled to 5.0% — and by February 2012, the number had more than doubled again. When I looked at the monthly trends in a graph, I could see that the numbers didn’t jump overnight but that they are creeping up slowly. Even though our total traffic fluctuates monthly, the number of mobile visits as a percentage of total visits continues an upward march. The numbers of mobile (smartphone and tablet) visitors are forecasted to continue to grow, so, what can you do? First, check out your own mobile stats from your Google Analytics and pay particular attention to the monthly trend data. I would be interested if you are seeing the same trend that I am seeing on our website. Second, make sure that your website is mobile-friendly. Check out this article from Dr. Dobb’s Report on the 7 Steps to a Killer Mobile UI for some quick tips. You may want to consider creating a special mobile application to address the specific needs of your customers and prospects. To help make your case for doing something in mobile NOW, I have attached some recently published research from comScore, The Pew Internet Project and Business Insider. You can download the entire comScore report for free after you provide them with the usual marketing information. And if you are not convinced yet, I found this slide deck on the Future of Mobile from by Henry Blodget, CEO of Business Insider. The latest Restoration Hardware catalog arrived by mail today. The 3 catalogs combined in one neat plastic bundle weighed in at 4.6 pounds, so it could have arrived by wheel barrow or burro because I wasn’t around for the delivery. While the catalog is artfully photographed and arranged, what company in their right mind is still sending out hefty and pricey catalogs in these days of social media-driven eCommerce? (And I would hate to think about the impact on the environment to print and deliver all 4.6 pounds of interior design ideas – talk about carbon footprints.) Not only was the catalog heavy, I didn’t see anything that mentioned any of Restoration’s social media accounts – and it was even hard to find a link to the Restoration Hardware website in the catalog. When I just visited the Restoration Hardware website, I didn’t even see any mention of social media anywhere. I did find a lame Twitter account that has not been updated in more than a year, but I couldn’t find a Facebook Fan Page. My rhetorical question is “hey Restoration, did you ever hear of Pinterest?”. 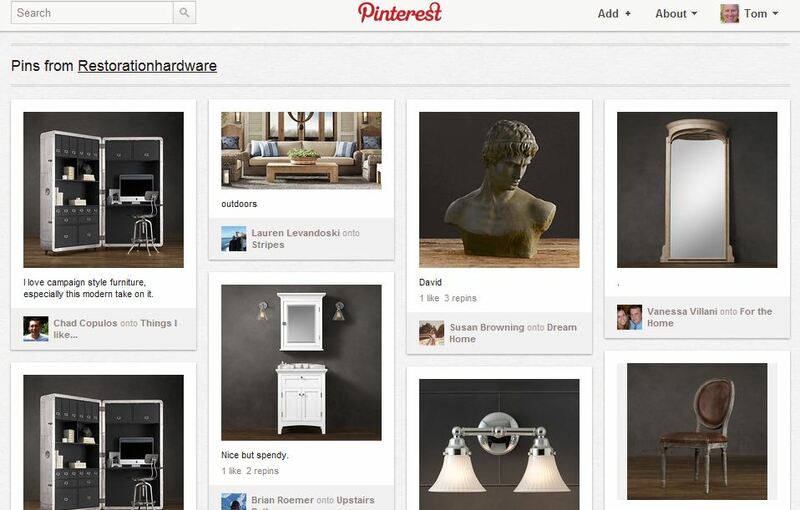 But then, I already know the answer to that because Restoration Hardware does have a very active Pinterest page. I am sure the US Postal Service appreciated the little blip in their monthly revenues from delivering these heavy tomes, but wouldn’t it have been easier to just send a postcard with a link pointing me to the Restoration Hardware Pinterest page? And if I were Restoration Hardware, I would then promote the heck out of the Pinterest page because it is much more social than a doorstop of a catalog that is probably heading directly to the recycling trashcan at most households. 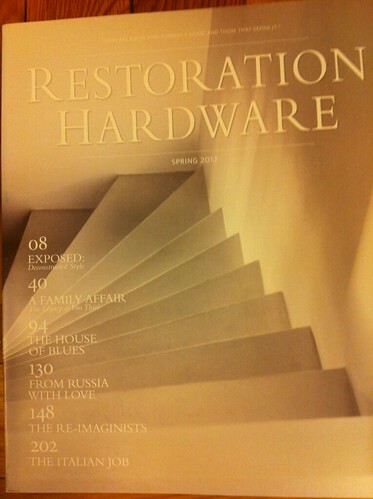 So, thank you Restoration Hardware for the catalog and inspiration to write a new blog post. My unanswered question is “does Restoration Hardware have a social media strategy?” Based on the latest catalog and how hard it was to find any social media activity, I think there is a huge disconnect between their print and digital strategies – and I would be curious to get an answer.